Gwen Cherne is a contemporary widow who spoke about her experience learning about and joining the War Widows’ Guild at an official dinner the night before the AGM. Below is a summary of her speech. My husband was Sergeant Peter Jon Cafe of Second Commando Regiment. He served in East Timor, Cambodia, Afghanistan and Iraq to name a few. He is survived by myself, his father, his four sisters, his daughter Ashleigh and her three children, and our children: Thomas, who is 18 and has just been posted to Townsville with the Army, Emily who is five and Lachlan who is two. I became a War Widow on the sixth of February of this year. A few months ago saying that I was a war widow, or reading it on my Gold Card, made me burst into tears. Now, it is something I wear with pride and gratitude. I am new to this club. A club I didn’t know existed really, or didn’t actually think about until a mere five and half months ago. 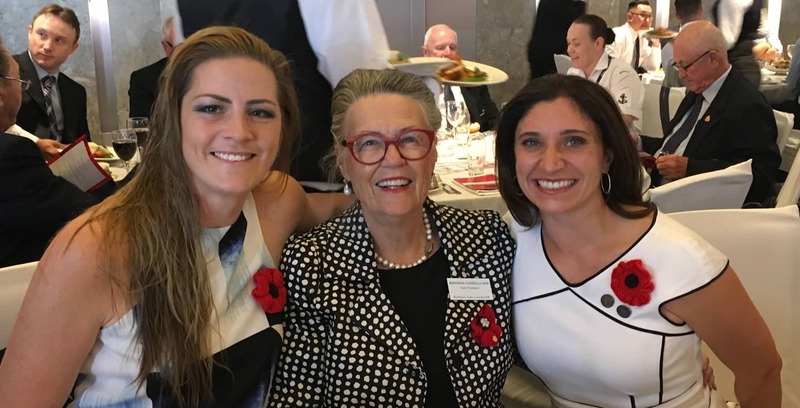 I first came to know of this club when Bree Till – our cover girl from the last Guild Digest, called me and told me I would be accompanying her at a War Widows event in Sydney in April the week of ANZAC Day. I didn’t look up anything about the event. I just knew I needed to attend and that I could bring my children. I was still so very fragile at that stage, but decided to go. I trusted Bree and knew deep down that she would make sure I was only attending events that would help with our healing. As I was getting ready, I was nervous and not entirely sure I should go, but I remembered something my mother always said to me: 80% of life is just showing up. I decided to show up and figure the rest out when I got there. As Emily and I sat on the train to Town Hall, I remember looking up the War Widows and the “Field of Remembrance” on my phone. Emily and I watched videos on YouTube, and I explained to her what it was that we would be attending. We talked about her father, how much he loved her, and how much he sacrificed for us and for Australia. When we walked up the steps to the Town Hall Chapel, I felt like running away. I actually felt like a fraud. I felt like I would be judged, unwelcome. I felt vulnerable and raw, like the nerves on my skin were completely exposed to the air. I hoped Bree had given them the heads up so that I wouldn’t have to explain anything when I arrived. A part of me wanted to just be there and blend in. I thought we had arrived just on time, but as it turned out, we were there early, hours early. Sometimes, God has funny of way of giving us what we need, and not what we think we need. I cannot remember who I met first. It was a blur of lovely and helpful women whisking Emily and me into the church pews and making sure we were okay. I felt welcomed and cared for, but I was still skeptical that if the truth of Pete’s death was spoken, I would not be so welcome. Someone came to sit with me and asked where Pete had been when he died. It was the question I was dreading. The one I felt would expose me, our story, and how I didn’t belong there with these women. All of them, many of you, whom I assumed had all lost your husbands gallantly at war. And many of you, like Bree Till, had. But many had lost their husbands back here at home years afterward. Obviously, I had not done my research, but I didn’t know that at the time. I was worried that Pete’s death would not be accepted. I thought that he would be seen as a coward, and therefore his service would not be valued the same as someone who had lost their life on the battlefield or in training. I could literally see her heart break for me; the empathy and compassion that she showed me in that moment was nothing short of a blessing. From that moment on, Rhondda, Meg, Patricia, other staff and so many widows approached me, sat with me, held my hand, held Emily’s hand, chatted to us and included us in the ceremony. I had never before understood the healing or power of being acknowledged for all we had been through and all we were going through. I realised during that day that I was now a part of this fabric, this beautiful club of strong women, and a few strong men. And while I was amongst complete strangers, they all seemed to know and understand me in a way that my family and closest friends simply could not. There is a look you give, an understanding you have. No words are necessary. I have never been on the receiving end of empathy that is so healing and so powerful. Thank you for welcoming me so warmly into the fold. I would not be standing here without you or without your love and support. You have paved the way and advocated to provide for all of us. The War Widows Guild has ensured that your needs are considered and hopefully for the most part are being met. If I have my numbers correct however, there are more widows over 100 years old in the Guild than there are under 60. I fear the number of widows under 60 is lower than it should be, not because we are not out there, but because we don’t know the Guild exists, or we do not think we would belong. Having met many of you I now know that could not be further from the truth. I know we have a right to stand beside you. I understand that you welcome us, and you are open to our new set of needs. Since Pete’s death, I have been on a mission to help other current military families, and those left behind. I have come to realise that part of my healing is wrapped up in being involved and ensuring my son Tom has a better, stronger and more supportive Army for him and for his future family. I have met with the Senior Leadership Group of the Australian Army, Special Operations Command and Military Families Australia. I have worked closely with a number of Non-Commissioned Officers and High Ranking Officers on a directive that sets out new expectations for proactive engagement with families to help build trust and provide access, resources, education and support for families. The role of fellow widows is powerful and probably underestimated. I say this because the first person to help me, to truly get me and what I was going through was Bree. If you haven’t met her, she is a force of nature. She is kind and fierce. A few weeks after my husband’s passing, she asked to come and see me. I didn’t know her very well. She sat with me, she asked who was supporting me. She made a list of names and organisations who were involved with us, Defence Community Organisation, Legacy, Commando Welfare Trust, Veterans and Veterans Families Services, the unit, etc. She knew that while the support is there, it is overwhelming to navigate – especially for a new widow. She talked to me about the support that I could expect and the support for which I needed to ask. Each widow needs to be able to grieve in our own time, but know there are people we can call on that have empathy and support. People who have been there before and know what we have been through. The more I learn about the War Widows’ Guild, the more I reach out to other wives and widows/ widowers, the more I realise the strength of an organisation like this one. And yet, the more I see the more there is to be done. There is so much more to be done. Contemporary widows’ needs are different than your needs. I have children who range in age from 2 to 18 years old. I work full-time and have no family to support us here in Australia. You have done so much for us, and we are grateful. Now, we look to your support, to help guide us. To help us determine what are the new needs, and how we can advocate for those, together. We respect the past, we are grateful to you for the way you have paved for all of us, and we hope you will welcome us in bringing our needs to light as the Guild continues to grow and change. In all honesty I cannot thank you enough for the warmth, kindness and generosity that I have received from many of you since Emily and I attended the Field of Remembrance. Thank you again for your time and support of us and this new generation of widows.